Shree Vrushbhanji's home and Shree Vrushbhanji receiving and weloming all the guests is related with this utsav.The shape of Vraj is just like a Lotus (Kamal). Vraj is just like half bloomed Lotus. Lotus has 3 layers of petals. Total 56 petals are their in Lotus. Thus with the bhavna of total 56 places of Vraj, Shree Prabhu is offered Chappanbhog. The Gujarati pronounciation of number 56 is 'Chappan' and thus it is known as Chappanbhog Utsav. In Vallabh Sampraday, their are main 8 nidhi swaroops in seven Gruhs. The preparation of bhog from all these seven Gruhs to 8 nidhi swaroopas i.e. 7 * 8 = 56 is chappanbhog. The common misnomer amongst the vaishanvas is that since 56 types os samagris are offered to Shree Prabhu, it is known as Chappanbhog. This is wrong since more then 300 types of samagris are offered in Chappanbhog. 3. Adhyatmik form: The main sentiment of vallabh Sampraday is 'Samarpan' to Lord Shree Krishna. Scriptures tells us that after assuming 84 lakhs different bodies, jeeva takes the birth as a human. The number of births after deducting this birth becomes 83,99,999 births. The summation of the digits of this number becomes 56. This means that jeeva dedicates all his sins done in all births onto the lotus like feet of Shree Krishna. In the treatise 'SidhhantMuktavali', Shreemad Vallabhacharyaji has described two categories of Service refering to the stage of devotee. Phal Rupa Manasi Seva: When a devotee is completely attached to Shree Krishna with profound affection and without least deviation of mind, service in such a state is called 'PhalRupa Seva' - the service in the state of accomplishment (maturity). Sadhan Rupa Seva: 'Sadhan' means instrument. The Service which is under the instrumental stage is called sadhan Rupa seva. In these types of seva, chappanbhog has its own unique importance and place. Describing the 'Vrats' of Maghsar month, Shree Naradji tells to Bahulasch king that 'Shat Pacchashatmaih Bhogehe Kuryaat Sevam Samahitah"
While setting up the Utsav and daily seva routine, Shreemad Vallabhacharyaji had taken the conclusions from panchashtra, vaikhanas, and Vedmishra Bhagwat. In this utsav seva routine, the special routine of chappanbhog utsav also comes. According to Vedic opinion, the swaroop of Chappanbhog is same as swaroop of 'Somyaga". Actually, if we really go in deep and analyze, we see that whole seva routine of chappanbhog is just like a 'Yagya'. 'ShadrutuMartand' granth has described the importance of Chappanbhog mahotsav and has also described the Adhvaryu,Udgata etc which are the part of somyagya and had compared with somyagya. Shree Gusaiji, on the occasion of Vivah of Shree Giridharlalji (First son of Shree Gusaiji) did the firt chappanbhog utsav in V.S. 1615 on Maghsar Sud Poonima and offered to Shree Govardhandharan Shree Nathji. From that day till today, the tradition of celebrating this utsav is being followed. Several great Acharyas of Pushtimarg i.e. Shree Gokulnathji, Shree Hariraiji and Shree Purushottamji had described the swaroop of Chappanbhog Mahotsav. Chappanbhog Mahotsav is not only about food i.e. Samagris. It is in fact a Bhav Pradhan Utsav. "Shree Vrishbhan sadan Bhojan Ko Nandadik Sab Aaye Ho"
pada by Shree Gadhadhardasji . Once, Shree Radhikaji requested Shree Vrushbhanji that she wanted to do darshan of Nandrajkumar otherwise she would not take food. To satisfy her, Shree Vrushbhanji invited entire family of Shree Nandraiji and entire Brajmandal to his house for meal. During this time, Shree Brahmaji did the secret Vivah of Shree Krishna and Shree Radhikaji at SanketVan. Since entire Vraj mandal went at Shree Vrushbhanji's house and since Vraj mandal consists of 56 main divine sport location of Shree Krishna and Radhikaji, this Utsav came to be known as Chappanbhog Utsav. The Kumarikas (Gop Kanyas) did the Katyayani Vrat for one month in Maghsar to get Shree Krishna (Nandraajkumar) as their husband. At the end of this VratCharya, Kumarikas (Gopkanyas) thought to offer the Chappanbhog to Lord Shree Krishna as a symbol of the completion of Vrat. Thus Shree Lalitaji first offered the Chappanbhog to Shree Nandraajkumar. The First chappanbhog utsav was offered by Vrajsimantinis to Lord Shree Krishna in Saraswat Kalp at Nikunj in girirajji. Indirectly, the Annakut Utsav was responsible to give birth to this utsav. When Shree Krishna himself in the form of Shree Girirajji did the bhog of Annakut, Vrajvasis were amazed and all Gopikas began to desire to offer such bhog in privacy. All gopikas requested Nandraajkumar to fulfill this manorath of Gopikas and Nandraajkumar agreed to do so. Assumed the form of sakhi and rest 24 Navnandas, 9 Upanandas and 6 Vrushbhanus assumed form of Patranis. Thus, in this way total 56 Sakhis did the Chappanbhog Utsav. 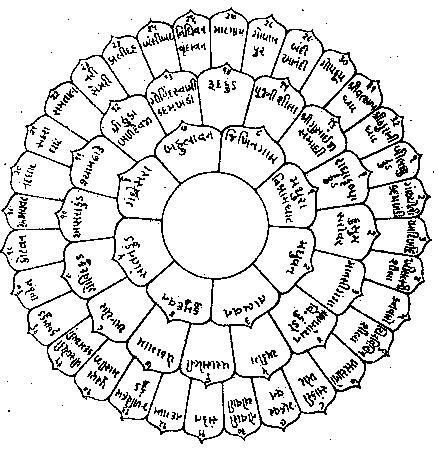 The Vraj Kamal (Lotus) also has three layers (8-16-32 petals) addition of which is 56. Thus all these 56 sakhis in this lotus are 56 petals and at the middle of Lotus, is Shree Krishna. There is a limit in the samagris offered. A specific amount (Neg) is only offered in Annakut.